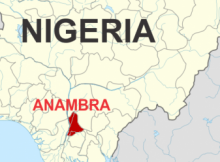 A young man identified as Chibuzor has been beaten to death by soldiers on the order of his father in Awka, Anambra state. According to Thisday, the only son had an altercation with his father after he brought home a lady he wanted to marry. Reports say the father refused his choice of wife, insisting that the lady was older than his son. It’s said that the deceased had earlier married with a child, but decided to remarry after separation from the first wife, and that he was disappointed when his father refused to give his approval to the marriage. “As the rift between the man and his father escalated, the father invited men in uniform, which resulted to the annoyance of the son who poured hot water on his father”, someone familiar with the event said. The action of the deceased resulted in his being beaten up by the uniformed men, and was rushed to the hospital when he collapsed, but later died. Meanwhile, tension rose Saturday in Umuayom village Awka, following the death of the young man as youths of the community went on rampage, making bonfire in protest of the death of their colleague. Confirming the incident, the State Police Public Relations Officer, Princess Nkeiruka Nwode, said the command had quickly deployed men to the scene, adding that the proposed wife of the deceased has also been rescued from the area.